Greyhound is a pest.. but drugged up on motion sickness pills and using sea bands, made the long trip more manageable. What we hadn't considered from back home was, that getting to the Canadian side of Niagara Falls requires going beyond the boarder and with that through customs. So we had to go through customs 3 times all in all, as our Greyhound tickets to Montreal departed from Buffalo. (Buffalo - (CUSTOMS)- Niagara-(CUSTOMS) -Buffalo -(CUSTOMS)- Montreal). Niagara Falls was worth all the work of having to go through customs though! And definitely has to be seen from the Canadian side too. 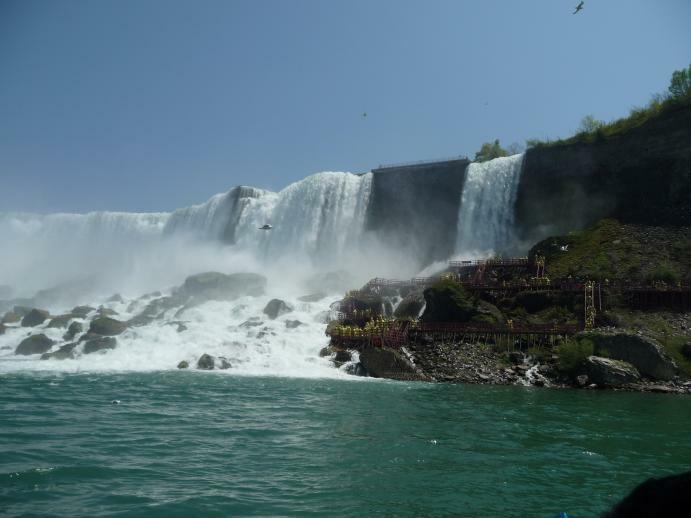 We ate brunch with a beautiful view over the waterfalls and afterwards we went on a boat ride with Maid of the Mist. The harbor from where it departed (and arrived) looked like some kind of smurf-gathering because everyone was wearing blue rain ponchos. The ponchos didn't really work that well though - we were still kind of soaked when we got back to shore ! We reached Montreal after having been on a bus for 30 hours in just two days. It was therefore very nice that we could already get our room/small apartment t around 11 when we got there. After a shower we SLEPT ! Montreal is a funny town. Half of it is French and the other half is English. We were living in the French part [oh-oh]. We went on a hop-on/hop-off bus tour around Montreal with a great guide ! We saw the Saint Catherine shopping street, Saint Joseph's church (where people walk up the stairs on their knees while praying !? ), Mount Royal Park cemetery and we finished at Dorchester Sq. Here our tourguide said, that we should try the famous Montreal smoked-meat sandwich - so of course we did ;-) It was HUMONGOUS ! It consisted of two small pieces of toast trying to contain 30-35 slices of smoked meat. It did not look appetizing, though it turned out to be DELICIOUS !! On the 23rd of May Maria woke Niko with a very good-looking birthday-muffin with Dannebrog on top and a birthday song ! We had a really nice day having dinner at the Mikasa Sushi Bar which involved sushi, sake-bombs and flaming Lamborghinis [a drink - much more dangerous than a burning car] !!! The rest of our time in Montreal we spend mostly indoors watching Netflix and eating Cheetos and Doritos , as the weather was pretty bad: rainy and cloudy (had nothing to do with hangovers). We did get on the hop-on/hop-off tour bus again - funnily enough with the same tourguide as earlier !! !